June 18, 2009 -- Most of the nation's airlines pushed through their first fare increase of the year this week and many of the same carriers have announced--or announced that they soon would announce--more route cutbacks and frequency reductions. The fare increase shouldn't come as a surprise since oil prices have more than doubled since bottoming out in the mid-$30 range last fall. Besides, the $10 one-way increase isn't likely to matter much since airlines weren't selling tickets at the lower fares and, as far as I can tell, the carriers still can't raise the price of not flying. The route and capacity cuts, which have been coming in waves since last summer's oil shock and the economic collapse of the fall, is more of the same: You can't deprive a traveler of a seat when they aren't flying in the first place. But logic has never been the strong suit of many of my colleagues in the mainstream media. They came to the astonishing conclusion that capacity cutbacks at the airlines will lead to your paying higher prices to fly this fall. No matter that they leapt to the same bone-headed conclusion when the airlines slashed capacity earlier this year, late last year, last summer and, with vary degrees of permanence, since 9/11. So let me spell it out again for them and for any of you who misunderstand basic economics: The price you pay to fly has almost nothing to do with the number of airline seats that airlines choose to operate. The only thing that drives up the price of an airline ticket is demand. If you want to fly, the airlines can raise the price you pay. If you don't want to fly, or if airlines raise published fares too high, the lack of demand drives the price of travel down. Got that? Airlines can slash their route networks and it doesn't mean a thing to the price of tea in China or the price you pay for a seat. The only thing that drives price is demand. Whether they fly one seat or a million, the only thing that matters is what you are willing to pay for it. Think I'm kidding or ranting? I thought you might, so I've done what most of my media colleagues have not: Looked at the facts as gathered by the good folks at the Bureau of Transportation Statistics. Then I went to a kiddie site maintained by the Department of Education and created a couple of kid-friendly charts. This stuff isn't rocket science, folks, so we can keep it that simple. As you can see by the chart at left, which tracks the industry's capacity, the nation's airlines flew 403,856,000 seat miles during the first five months of 2001. (A "seat mile" represents one seat flown one mile and it is the industry's basic measure of overall capacity.) 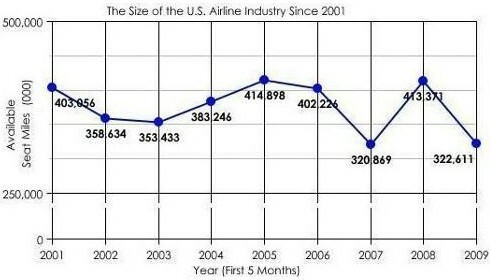 After the catastrophic terrorist attacks of 9/11, airlines began pulling down service and they had contracted by about 11 percent during the first five months of 2002. The industry shrank further, albeit it fractionally, in the first five months of 2003. Now look at the second chart, which represents the nation's "average" price paid for an airline ticket. (It is an admittedly crude and inexact indicator, but it's the best available.) From an average of $338.21 during the first two quarters of 2001, prices dropped both in 2002 and 2003--even while the airlines were pulling down their capacity at a then-record pace. Why did fares fall while capacity fell? Demand, of course. There wasn't any. Most business travelers were chained to their desks during the 9/11-inspired recession and leisure travelers were literally afraid to fly. The industry reduced capacity somewhat in 2006 and fares did rise almost 10 percent from their 2005 lows. But look what happened in 2007. The industry slashed total capacity by about 20 percent, to a post-9/11 low of just 320,869,000 seat miles during the first five months of the year. But did fares rise? Nope. They fell--even during the sharpest capacity reduction in the post-9/11 era. It gets even weirder last year. Not only did the industry restore all of the capacity cuts it made in 2007, it grew to its largest size since 2005. Did fares plummet because of this massive increase in capacity? Of course not, they jumped up to an average of $342.24 during the first five months of 2008. That was higher than they were even during the first five months of 2001. And what about this year? As you can see by the chart, the industry's capacity in the first five months of 2009 has plummeted again, down almost 22 percent against last year and within a whisker of the lows of 2007. The fares? The government doesn't have figures yet, but you know what you're paying. At a time of near-record lows in capacity, airlines are having trouble giving away seats. We've had $99 one-way coast-to-coast airfares, $1,300 roundtrip business-class fares to Europe and endless streams of systemwide fare sales. So, please, fellow travelers. Whenever you read a mass-media story claiming airline fares are about to skyrocket because the carriers are pulling down capacity and canceling routes, remember what the facts say. And, please, fellow journalists, stop writing garbage. 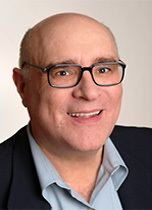 Stop listening to the same old analysts, most of whom don't fly and even fewer of whom have ever been right about anything to do with commercial aviation. And please stop listening to and quoting idiotic airline executives. They have been trying to shrink their way to higher fares since the dawn of deregulation. It never works, they are too stupid to get it--and you're not doing your job if you quote them without pointing out the facts. Only demand matters. And, lately, no matter how low the airlines price their seats, there is no demand. According to the government, there were about 162 million "revenue passenger enplanements" during the first three months of this year. That's down more than 10 percent--or about 19 million--compared to the first three months of 2008. Demand down, prices down. That's how it works, folks.